The original Garage Series beer is back for its third year. It's nearly February, and fans of coffee stouts already know that means the return of War & Peace is imminent. Beginning at noon on Saturday in our taproom, it will be available -- as is the case with all Garage Series -- for a very limited period of time. The taproom will be offering $6 (10 oz) pours and 750mL bottles to go for $15 each (limit 2, until we run out). To add to the fun, our friends from Peace Coffee will be there sampling their delightful brews as well. In the following weeks, you'll happen upon War & Peace around the metro on draft and in bottles. Mark your calendar for Thursday, February 6th, when Butcher & the Boar will be tapping not only one of the first War & Peace kegs, but also Patience and one of just a few kegs of Libertine that's been aged in special Butcher & the Boar edition Knob Creek bourbon barrels. Yum. Never had War and Peace? It's our Russian Imperial Stout conditioned with whole bean Peace Coffee in the tanks. It's an epic work of beer, featuring historic quantities of chocolate malt, roasted barley, and dark roast Peace Coffee. Like Tolstoy's masterpiece, it may take some time to finish, but by the end, we think you'll find yourself better for the effort. SO, WHAT'S HAPPENING AT THE NEW BREWERY? Many, many things. Our contractors have been busy setting floor drains, tiling in the brewing, fermentation, and packaging areas, framing new walls, installing hangers for glycol runs, preparing steam piping, painting...and that's just this week! 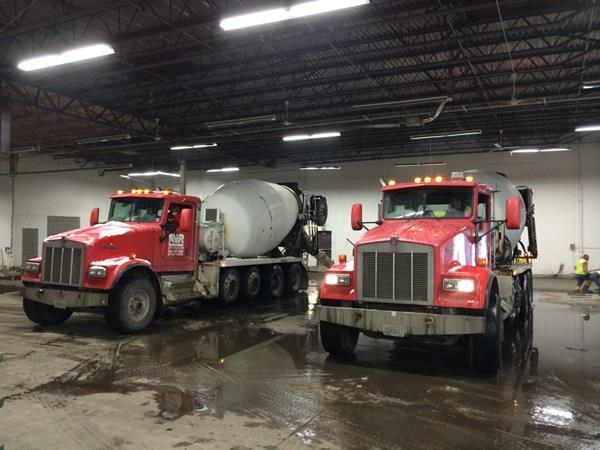 Early January saw the completion of process plumbing, pouring 8,000 square feet of new concrete, and much more. The building renovations are rapidly nearing completion, and meanwhile, our brewing equipment is getting closer and closer. We already received our glycol chillers, and in just a few short weeks, we'll be receiving our fermentation tanks and boilers. 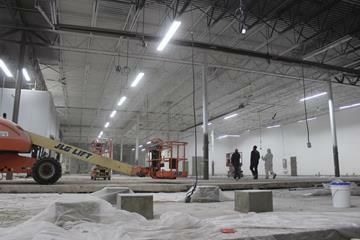 From there, it won't be long before the brewhouse and bottling line arrive. Check out some more progress photos below. 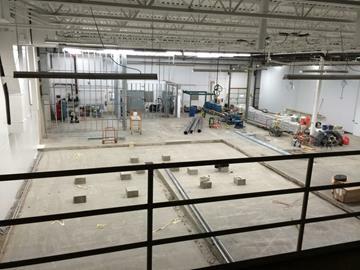 Setting the trench drain in the brewhouse area and framing in the boiler room walls (background). 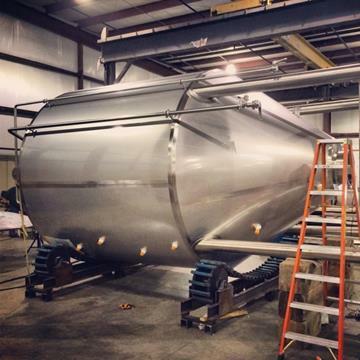 One of six 160 barrel fermenters getting ready for its trip to Minneapolis. The recent arctic cold spell has had most of our state bundled up indoors, wondering if it will ever be safe -- or sane -- to venture outdoors again. Just when we thought we couldn't endure any longer, it looks like temperatures might spike not just above zero, but all the way above freezing this weekend. That alone is reason enough to leave your lair, and here's another: when the taproom opens on Saturday, we'll have our new barleywine, Patience, available on tap ($6/10 oz pour) and in bottles to go ($15/750mL). At 13.2% ABV and 88 IBU, Patience is deserving of its namesake. Grant it the time to warm in your glass, and Patience will reveal layer upon layer of malt complexity. Give it time to age in the bottle, and it will mellow and develop further for up to several years. At just over 200 cases, this is the smallest bottling run we've ever done. Liquor stores will receive small quantities of bottles next week, and a handful of kegs will make it to bars as well. Patience may be a virtue, but in this case, if you don't act quickly you may be left out in the cold. 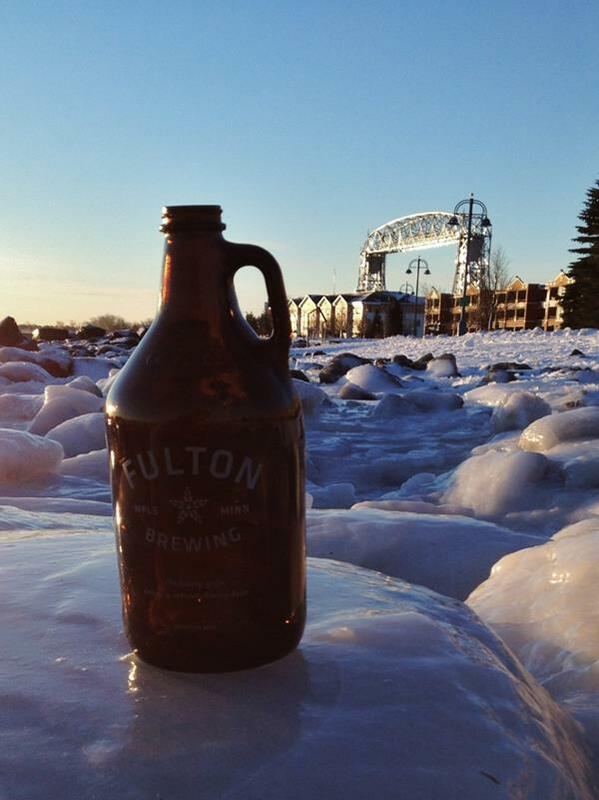 We are pleased to announce that beginning later this month, you'll be able to find Fulton on draft in Duluth. We're launching on Tuesday, January 21st with a beer dinner at Grandma's in Canal Park. Tickets are $55 (including all beer, food, tax & gratuity) and can be reserved by calling 218-727-4192. The next day, we'll be next door at Grizzly's for a tap takeover. In addition to Sweet Child of Vine and Lonely Blonde, expect to see such rare treats as Libertine, Batch 300, and maybe even the all-new Patience. In the following weeks and months, you'll notice our draft lines all over town, and later this year, bottles will be available in Duluth as well. SUPPORT YOUR LOCAL PACKAGING BREWERIES -- AND GET A GREAT DEAL ON GROWLERS & PINTS, TOO! Here's a great excuse to visit more Minnesota breweries and get a discount too: pick up an MNBA Punchcard. The punchcards come in two versions, one for growlers, the other for pints. The growler version retails for $75 and gets you a growler fill (growler deposit not included) at each of 11 participating breweries, while the pint punchcard retails for $35 and can be redeemed at 10 different breweries. The only way to get one is by visiting a participating local brewery. Participating breweries include Fulton, Indeed, Liftbridge, Excelsior, Castle Danger, Steeltoe, 612, Hammerheart, Third Street, Bent Paddle, Jack Pine, Flat Earth, and Northgate. Quantities are limited, so pick one up before they're gone. What is the MNBA, you ask? Last year, Fulton and nearly two dozen other breweries formed the Minnesota Brewer's Association, a group dedicated to monitoring, protecting, and advancing the legislative interests of Minnesota's packaging breweries. The MNBA made an immediate impact at the Minnesota legislature with our "Save the Growler" campaign, which extended the rights of small breweries to sell growlers. All proceeds from the punchcard sales will go to funding further efforts by the MNBA.